What is the Amillennial position? Nathan Jones: You know, Don, I and many other people grew up with Hal Lindsey's The Late Great Planet Earth. I also read every one of the books in Tim LaHaye and Jerry B. Jenkins Left Behind series, and so generally I always thought that there was primarily just the Pre-Tribulation and Pre-Millennial viewpoint. But, the more I studied Bible prophecy the more I realized that this view is a minority case and that most people especially like the Catholics believe in an Amillennial position, and lots of Protestants do, too. Can you explain what the Amillennial position is? Don McGee: Kind of in a nutshell, the early church was Pre-Millennial, and I use that term broadly because there were a lot of varieties of that especially 2,000 years ago. When I say "Pre-Millennial" I'm meaning that the return of Jesus is before the Millennium at the Second Coming of Jesus to this earth. Jesus will come and reign for a thousand years. The Amillennial view came in with guys like Origin and Constantine and people like that. Those men came out of a background that said philosophically that anything of the body, meaning anything physical, was bad and that it was only the spirit that counted. It is Gnosticism basically. Amillennialists when they got into Scripture spiritualized it by saying, "Jesus is not going to come back to a literal earth because a literal earth is physical, therefore it is inherently evil. Jesus cannot do this so what I have to do now since I am denying that is then I have to come up with an idea that I can believe." What they came up with was Amillennialism. The "a" there is often called the alpha-privative and it simply means that it negates the Millennium. In Greek if you put an "a" in front of a word it negates the word. So, there is no Millennium to them. That is what they did and that is where the term Amillennial comes from. Nathan Jones: They do not then believe in a literal 1,000 year reign of Jesus on earth? Don McGee: They do not believe in that. They believe at the Rapture, though in fact they don't even like to use the term Rapture, but they believe that when Jesus does return it could be even 10,000 years from now. As they say, Jesus does come back and takes the Church out, but they don't even refer to it as the Rapture. They call it the Resurrection. They believe that — Bingo! — 2 Peter 3:10 kicks in and the earth is destroyed and burned up and that's it. Dr. Reagan: They take the position that the Millennium actually began at the cross? Don McGee: Yes, and that we are in it right now, though I can't understand that. If Jesus is ruling and reigning over this world right now. He is doing an awfully bad job of it and I have some correction to offer. Dr. Reagan: Yes, they argue the Millennium began at the cross. Early when Augustine began to argue this he argued that Jesus was going to reign for a 1,000 years and then He will come back. Well, in 1000 AD Jesus still hadn't come back, so then the spiritualizers had to spiritualize the first 1,000 years and they've been doing that ever since then. Don McGee: The majority of Christendom (and I use that term very broadly) is Amillennial. Dr. Reagan: That they argue we are in the Millennium right now is so hard to believe since the Bible says that during the reign of Christ the earth will be flooded with peace, righteousness and justice as the waters cover the sea (Isa. 11:9; Hab. 2:14). They also argue that Satan is bound now because it says when the Millennium begins he is going to be bound. Do you believe that Satan is bound now? Don McGee: Peter says he's not. Peter says that he is roaring lion, and that was written after the resurrection (1 Pet. 5:8). And, Peter says that he is out to devour anyone that he can. So, no, Satan is not bound. Dr. Reagan: John many years after the Resurrection said the whole world is under the power of the evil one (1 Jn. 5:19). Satan was bound by the cross in the sense that believers ever since then received the indwelling of the Holy Spirit and now have greater power in combating Satan. But, it says in the Book of Revelation that Satan will be bound and that he will no longer be able to deceive the nations (Rev. 20:2-3). That is a special kind of binding. Don McGee: He is not talking about Satan not deceiving just the Christians. He is not talking about Satan not deceiving just the Jews. He is talking about the whole world. Dr. Reagan: Also, the Bible says that when the Millennium begins that Jesus Christ will reign on the throne of David. Is He on the throne of David right now? 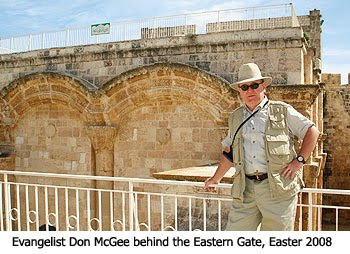 Don McGee: He is not on the Throne of David right now for several reasons besides the obvious. Secondly, the throne of David never has been, is not, and never will be in Heaven. It is in Jerusalem. So, Jesus is at the right hand of His Father on His Father's throne. He is sitting on a chair, but He is not on a throne, if I can use that term. Nathan Jones: Amillennialists will say that there is a spiritual kingdom, and I believe that is true. There is a spiritual kingdom where Jesus rules and reigns over the Church, but not a physical kingdom which is totally dedicated to the Millennial Kingdom time period. Don McGee: Well, I don't see how they could come up with that either. One of the problems that Amillennials have is that they try to take the Kingdom of God and try to put it into the Church. If you go to Luke 13:28, Jesus Himself talks about Abraham, Isaac and Jacob being in the Kingdom of God. Now, were they in the Church? I mean, were they Pre-Pentecost or Post-Pentecost? They aren't in the Church as we know the body of Christ to be and yet they are in the kingdom. Dr. Reagan: Let me play the Devil's advocate for a moment. I have actually had people write in several times and tell me this idea of Jesus reigning a thousand years is only mentioned in one place in the Bible in the book of Revelation and therefore it's not that all important and also it couldn't be true. Don McGee: Do we have a test that if something in the Bible is mentioned three times it is no good, or if it is mentioned five times, but that it's like got to be mentioned ten times for us to finally believe it to be true? Nathan Jones: Six times I found "a thousand years" as the description for the length of the time period, found in Revelation 20. Dr. Reagan: Why isn't it just good enough if God just mentions something once? I have also had people write in and say, "Well, now, if you go over to 1 Peter you will find that it says that Jesus is going to come and the earth is going to burn up immediately afterwards, and so how can there be an earth for the Millennial reign?" Don McGee: It is going to burn up, but that's going to be before the eternal state. You have to consider all the prophecies about a topic altogether. You don't take one prophecy out of context and stand on it and declare that this is all God has to say about that. Well, you do if you want to "prove" your own point. Actually, the Millennium is needed because God is going to fulfill a lot of the promises that He's made to the nation of Israel, and He's going to fulfill the promises that He made to the entire world. But, there is another aspect to this. If there is no Millennium, then Satan wins and God loses. In the Garden of Eden everything was perfect. God says this is the way that I want it. When sin entered there came following a curse, and we are experiencing the consequences of that even today. But, there will be a time coming when Jesus is going to take back from the clutches of Satan that which He created. Sue? Doc? You guys got raptured? I see you got "Left Behind" also! About mid-day on May 21 here, after sundown in Jerusalem [since they are the real center of the world], it was technically the 22nd, so I called up my sons to find out if any of them had missed Camping's rapture too. I usually have my monthly epiphany on the 2nd... Oh! That's today. I wuz checking [in vain] the last several postings on this site for any new comments or news and wondering why there hadn't been any activity for a day when I suddenly noticed that little word "July" in the upper right sidebar, right above the little word "June" and then it dawned on me; you guys were all in the new month now! This has been happening to me [sorry to admit it] for about the past 2yrs. We've been off-line 4 about a week trying to recover files off my wife's HDD. We were down to 1 compuker [hers] and it was bogging down really weird frequently so she ran a virus scan & found a 'root-kit' Trojan with a key-logger. When she deleted it, it apparently had a 'farewell' hook that gave us an unrecoverable 'blue screen of death', so we've been having 'fun' rebuilding it. would likely be off line for a bit. Thanks guys. I do recall now that she was having PC issues. I have them all the time but my puter works fine. in there that is all that interesting. Tens of millions of our hard-earned tax dollars used for experimenting on Zulu women in South Africa. oystersman: Bill Gates is funding this? It's yet another reason to dump that bloated crapware called Windows in favor of alternative operating systems like Linux Mint or Ubuntu. They're many times cheaper, anyway (it's free!). Looks like Microsoft's operating systems are not the only thing getting a blue screen of death. Kem, Seem like all the email providers are wanting 'linked' accounts and seem to be consolidating info for the NWO. I only give up paired alias accn'ts: A linked to B but not to CDEFG, C linked to D but not to ABEFG, etc. Welcome 2da Nue Whirled Oder! My puter is being nursed by my ‘godson’. It’s still a bit wobbly, so I am reluctant to be too adventurous as yet, but I am chancing this because of a very serious issue indeed. Coming up - I hope? CAUTION – to Post-Tribulationist AND Pre-Wrath brothers and sisters in Christ. I have evidence to warn – very strongly – that Pre-wrath British author Neville ?, pen name ‘Dusty Peterson’, has devised a master plan to escape the tribulation by buying a house on the Island of Gozo, off Malta, and hiding out there with the chosen few, consisting of himself and anyone stupid enough to sign a cheque to him. He told a single lady that in return for her parent’s assets, he will help her elderly parents to escape when the Tribulation hits. He has been pressuring a married couple to sell their home and business to help fund the ‘escape’; also an elderly man in Wales. He has defrauded (mainly women) of their assets and inheritances to the tune of many, many thousands of £’s; not only from the U.K., but also other countries. (To date, two sums of £50,000 and £35,000 are known about and there are other unnamed people). This has been going on for two, plus years now, and ‘Dusty Peterson’ has chosen to ignore requests for refunds and lie through his teeth with denials. His victims are being advised by Elders to go to the Serious Fraud Squad, for their own sakes as well as to stop him from ripping off any more who are fearful of going through the coming Tribulation. As yet, the victims have not taken legal action against this ‘christian brother’, presumably because of the Scripture that says don’t take a believer to court? To make matters much worse, this villain is spiritualising Scriptures to frighten, convince and deceive folk into backing his ESCAPE campaign. All we can do is warn as many as we can, and as Posties and Prats like to keep a wary eye on this Pretrib blog, the warning will be going to a far wider audience until it is made public when the law nabs him and the Media broadcasts the case. (More shame heaped onto the church). In my personal contact with this idiot via Bob Mitchells Shofar Postie blog (his ‘good’ friend) he was a mealy mouthed bully fully adept at Scripture twisting and context violation via Covenant Theology’s Allegory and ‘Progressive Dispensationalism’. I can assure you I gave him several well aimed shots across his bows from The Canon. Until recently, I had always felt guilty for being so strong in contending with him for the Truth. NOW I know that my discernment of this deceiving, cheating toerag was correct. If the name ‘DUSTY PETERSON (Neville ?) is familiar, he wrote a critique with co author Elizabeth ? about ‘ALPHA’. Having the cheek to point the finger at the heresies of others, when he is just as bad. Sue, does that mean Neville(?) intends to escape the purification of the tribulation? PS I've been in touch with the church below re a pro Israel PDF file written by Dr Paul Wilkinson. He's the gent who wrote "For Zion's Sake" as part of his PhD. They seem dispensational and biblical and have a catalogue of free literature. Might pay to look into it. Hazel Grove Full Gospel Church, 68 London Road, Hazel Grove, Stockport, Cheshire, SK7 4AF. Tel. 0161 682 1157. Email: grainforthefamine@hotmail.co.uk. I am confident you refer to Dr Paul R. Wilkinson who is on the British Council for the very kosher PWMI The 'Prophetic Witness Movement'. It is Pre-trib and Dispy. They print articles from 'Israel My Glory'. They had links with D.L. Moody and FB Meyer. Paul has a continuing article in this months Magazine "You Shall Be My Witnesses". He writes of Amzi Clarence Dixon (1854-1925)from Shelby in North Carolina. When he came to London he dined with Sir Robert Anderson of Scotland Yard who wrote the Christian Classic 'The Coming Prince'. PWMI began in 1917 - and no, I wasn't at the opening! Dr.Arnold Fruchtenbaum and Dr J. Dwight Pentecost are among the Vice Presidents. Although I don't know the Church, if it is backed by PWMI then it must be 'safe'. Sounds like you have your finger firmly on the pulse, Sue. Wolves in Post-Tribber clothing is becoming more common and I'm hearing more scams like these increasing. A young couple made an entire website trying to prove children won't be raptured and for a fee they'll take care of the Pre-Tribber's kids. It's a former "Christian" turned atheist's site. Saw another site that offered the same thing for pets. Another site run by a Jewish lawyer will help make sure your assets get delivered to whomever minus his fee. Sadly, people are sending money to these people. My PC started crashing just after I had a warning of 313 suspicious activities on my identity. Still don't know what's been up with it. It still has a few odd moments? I am appalled to hear there are other scams cashing in on the coming Tribulation. What made my blood really boil is the false application of Scripture 'Neville' (Dusty Peterson) is using to put the fear of God into at least one ‘silly woman’. She thinks she will be as bad as him if she takes him to court! His arrogance is contemptible and underlines the absolute necessity for a Literal interpretation of Scripture. Allegory is a trap door into the nether world. What a charlatan he is; and what makes them all believe Gozo will be exempt from the attentions of the a/c? The Revelation says the WHOLE world is to be infected, bar the Petra area of present day Jordan. This reminds me of a date setting PRE-trib bloke who recommended that I ‘buy’ a new washing machine on credit as I wouldn’t have to pay for it – for the same reason. That was around five years ago; it makes me shudder to think if anyone took his advice as they would be in serious debt by now? This has nothing to do with Faith in Christ; this is wilful abandon of His instructions to ‘occupy’ until He returns. It all boils down to greed and fear based on ignorance of the Truth. Know THE Truth and THE Truth shall set you free.